Once you pick your mission and set up your board, everybody picks the character they want to be. The original game has six different characters: Phil (the ex-cop), Wanda (the beautiful carhop), Doug (the paper pusher), Amy (the Goth), Josh (the thug), and Ned (the crazy hermit). Each character has a special ability. For example: Wanda can move two zones for each move action she takes, Ned gets a free search action, Phil always starts the game with his trusty pistol, etc. 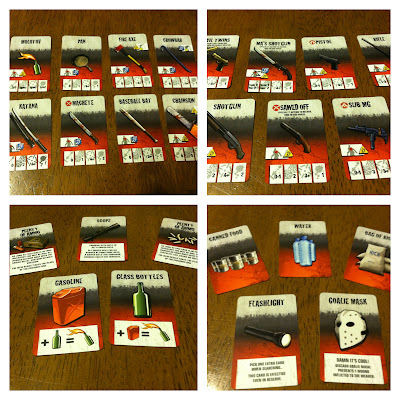 Each character has a matching character card which helps the player track experience points, what items they have in their inventory, how many wounds they have, and what their special ability is. With everything set up and passed out, the beginning game weapons are randomly assigned and the game begins! Each character begins the game in the blue experience zone. As you accrue experience you move your tracker through the yellow, orange, and eventually red zone. Each new zone gives you new ability but also increases the level of difficulty of the game. Zombies begin to spawn at a higher rate, with greater number and abilities. Each turn you have a set amount of “actions” you can take. “Actions” include: moving board zones, searching a room or car, attacking zombies, opening a door to a building, equipping a weapon, trading a weapon or aid card with another player, and making noise. Every game has spawning points for the zombies. They can be on the streets and in buildings. Once every character has taken his or her turn, the zombies get their chance. 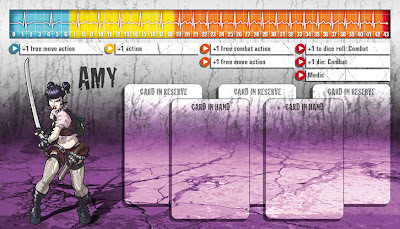 If any zombies are already on the board then they attack or move (depending on where they are). Then a spawn card is picked for each spawn point and the zombies’ turn is over. Some spawn cards call for zombies to spawn in zones where there are sewers in the streets (those are always fun…). If a character is in the same zone as a zombie and it is the zombie’s turn, then the character will be wounded. After two wounds a player is considered dead and removed from the game along with any items they had in their inventory. There are four different kinds of zombies in the game and they all have different abilities. Walkers are what you typically think of when you think of a zombie. They can only move one board zone at a time and are the first to be killed. Fatties are large zombies and they always spawn with two added walkers (three for the price of one… oh yay…). Fatties can only move one zone at a time but they can only be killed by a weapon that has a hit point of two or higher. Runners are exactly like walkers when it comes to strength but they can move two zones per “move action.” These guys can sneak up on you fast if you’re not paying attention. The abomination is the strongest and hardest to kill zombie in the game. Thankfully he can only spawn once in the whole game (although this rule is rather ambiguous and has a full out debate going on online). He can only move one zone per turn but he can only be killed by a Molotov Cocktail (which can only be created when one player has both the glass bottle and the gasoline aid card). You may want to be careful when searching, sometimes that pile of rags turns into a zombie! There are three main reasons why I gave this board game an EPIC review: one: the game mechanics are flawless; two: this is the only game I’ve ever played where teamwork is essential and actually makes the game more fun; and three: the artwork and attention to detail in the figures, the board tiles, and the character and item cards is absolutely beautiful. I’m going to start with the mechanics. The creators of Zombicide (Guillotine Games) must have put thousands of hours into figuring out the game mechanics to this flawless game. I have never experienced frustration about how the cards, characters, spawning, etc. works. Each mission move smoothly without it ever feeling like it’s just impossible to accomplish (although this can greatly be affected by who you’re playing with and how good of a team you are). Teamwork is essential to survival! Teamwork is essential to this game if you want to get everybody out alive. This is the only game where my competitive nature doesn’t make me end up hating someone by the end of the night! We work together as a team with every person giving input into each players turn. We discuss options and attack plans. Some people play with the rule that you can only talk to the people who are in the same board zone as you and if you do talk you, must lay down a noise tile. (I know I’ve talked about noise several times. This is only important because zombies move toward noise on the board if there is no line of sight). This makes the game feel more real and authentic, because in real life if I’m on one end of the street and my friend is all the way down on the other end of the street, and there is a hoard of zombies between us, I’m not going to scream down the street to them. But my friends and I don’t play this way (to each his own). Lastly the artwork for this game is a wonderful mixture of grunge (this is a post zombie apocalypse world), gore, architecture, blue prints, and comic books. 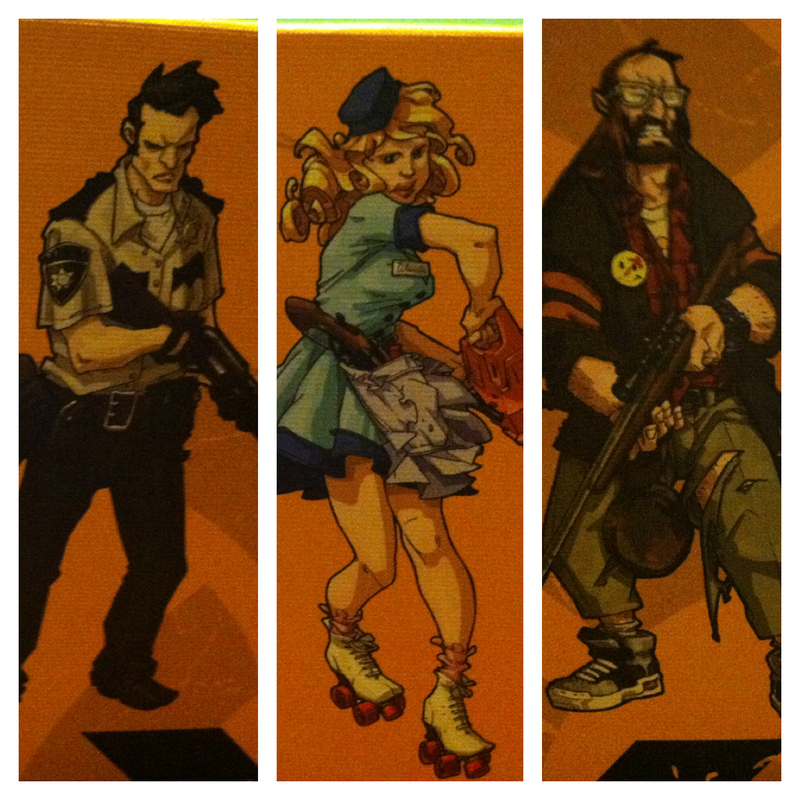 The style is very comic booky in regards to the character drawings and basic art. The streets are grunged up with graffiti, piles of guts lay in abandoned rooms, buildings are filled with what where normal rooms now vandalized and gorified. This game isn’t just fun to play. It’s fun to look at too. There is always a new detail to find in each room. There are also many different “Easter eggs” of other geektastic things lying around. For example: the character Ned has a smiley face button on his outer jacket. It has a splash of blood on it rather reminiscent of Watchmen (go back up to his picture in this post and see for yourself!). 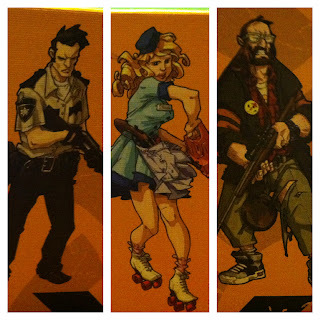 All in all this game is definitely a must buy if you are a zombie fan or even just an avid board game player. I promise, if you get a group of people who can work together, this game will be the most fun you have had in a long time! 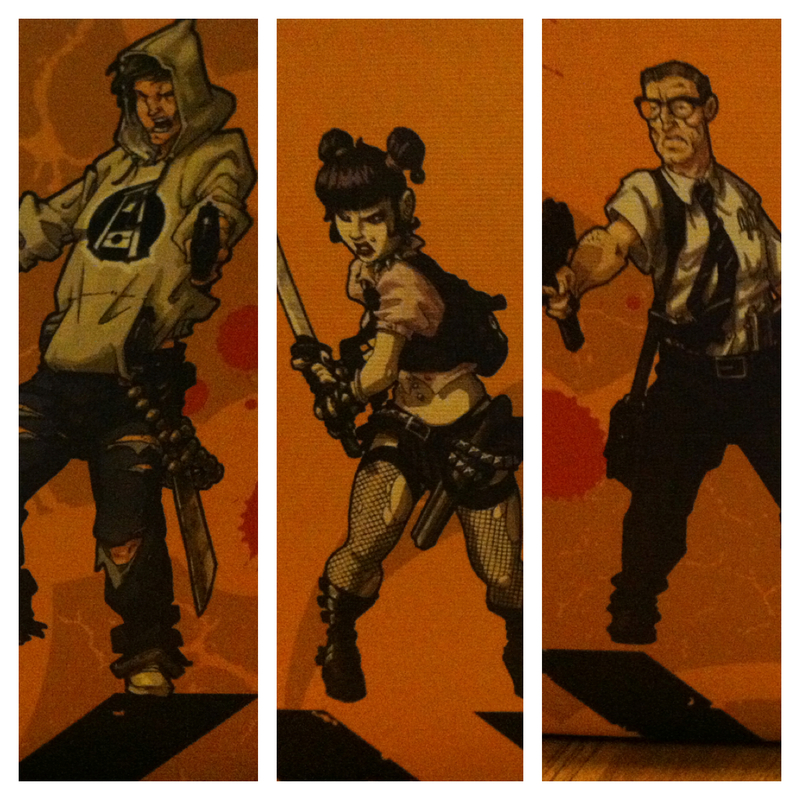 Hanging out with friends, working together, and killing zombies: what’s more to love? Go check out Barbecue17's flickr account to see more impressive shots of this game. Generbeener hopes this review has inspired you to buy your own copy of Zombicide. The world needs more Zombie Killers!